RTSVX front month futures expired today (they expire toward the beginning of the month) so it is time to forecast next expiration. 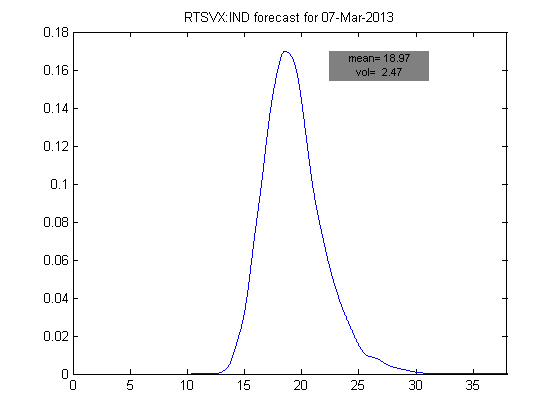 My model predicts RTSVX to close at 18.97 vs March futures at 25.85. This is a significant discount, even lower than the current value of the Russian Volatility Index at 19.95. As usual all forecasts are tracked monthly at forecasts tracker spreasheet. Now that I am tracking all tradable volatility indexes it is easy to see that the model is decidedly bearish on the volatility, although these forecasts are not for speculation, but purely to track forecasting accuracy of my volatility model in different markets. P.S. I have updated Volatility Publications page with few gems: first latest from Christopher Cole titled Japan's Attempted Reflation, second an old publication from excellent team at Barclays titled Valuing Vol of Vol, and last but not least a publication from GS titled VIX regimes over the last 23 years. I wrote about VIX regimes back in September 2010 where I identified 3 VIX regimes, but GS team used a very different methods for their analysis. I am planning a follow up post on volatility regimes using more recent data.